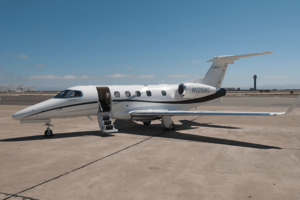 Pacific Coast Jet, a locally-based private aircraft charter company, announced today that it has moved its Phenom 300 private jet to the new world-class fixed base operation (FBO) Signature Flight Support at Silicon Valley’s Mineta San José International Airport. Developed by Brazilian aircraft manufacturer Embraer, the Phenom is known for its impressive engineering while maintaining luxury and economic performance. The roomy 17-foot cabin accommodates six passengers with adjustable, fully reclinable seating and luxury amenities including in-flight WiFi, a fully stocked galley that is the largest in its class, the largest windows in its class, and advanced soundproofing. A full lavatory with sink gives executives extra comfort on longer flights for a premier private jet charter experience. The Phenom 300 is one of nine in Pacific Coast Jet’s fleet, which also includes a Citation Mustang, Citation CJ1, Citation Cj3, and Citation Sovereign. From local flights around San Francisco, Oakland, Sacramento, Silicon Valley, Napa, and San Jose to Coast to Coast and Hawaii, Pacific Coast Jet offers clients flexibility and luxury throughout the US. Pacific Coast Jet additionally has access to more than 5,000 aircraft worldwide with the ability to arrange planes and itineraries to meet any needs. Pacific Coast Jet is committed to the highest level of customer service, luxury and flexibility in private jet charter travel. Based out of the San Francisco Bay Area, they charter itineraries all over the world. For more information visit pacificcoastjet.com or contact 888.725.3871. Jet Insider: Join our exclusive insider group & be the first to hear about reduced rate, last minute one-way flights. ©2019 Pacific Coast Jet. All Rights Reserved.